Where is the economic development profession headed? The best way to assess the direction a profession is heading is to listen to what the emerging leaders are saying. Who are those emerging leaders? Development Councellors International (DCI) has recently published its list of the latest 40 Under 40 winners. These are U.S. based economic development professionals who have been recognized as their peers as the emerging leaders of the future. Click on the image to see the list of awardee names. First, congratulations to those ED pros who earned the recognition as among the best of the best in the profession. These are the people who are shaping and will continue to shape the direction of economic development in the U.S.. As always it is an impressive group of diverse people. Second, I am looking forward to continuing the 40 Under 40 podcast series. These podcasts provide you insight into what 40 Under 40 awardees see as the challenges and opportunities facing the profession going forward. 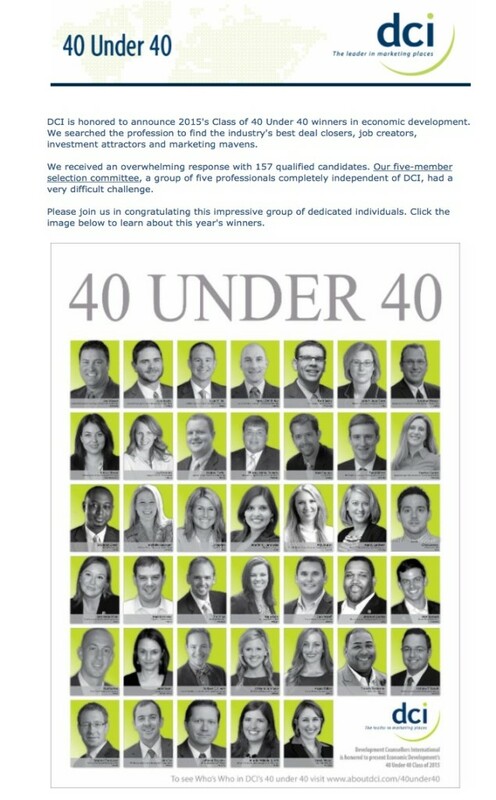 I hope to interview all of these new 40 Under 40 inductees throughout the year. If you want to listen to podcasts from past 40 Under 40 awardees, please CLICK HERE. I also want to draw your attention to a FREE eBook I recently published. I asked U.S. based experts in place branding to share their advice on effective place branding. The feedback was amazing. If you have anything to do with your community, region, or state branding effort you will find valuable insights in this publication. I encourage you to download it and to share the link with your colleagues.